Several years ago we were first introduced to The Critical Thinking Co.™ through their Mind Benders Series. Since then we have used several titles from their award winning books and we haven't been disappointed in any of them. Our newest book is The Critical Thinking Detective: Vocabulary Book 1 and it has been a great addition to our Language Arts studies. The Critical Thinking Detective Vocabulary Book 1 is recommended for grades 5-12+. It is a 38 page softcover workbook with 12 mysteries. Each mystery has a story to help you solve it and the there are 15 sentences for you to fill in the missing vocabulary word. 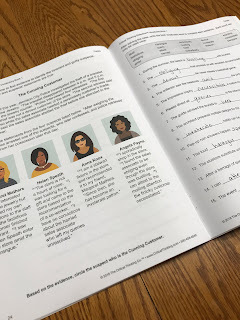 There are also tips to help you solve the mysteries and all the answers are included in the back of the book as well as a synonym for each vocabulary word. Each mystery uses 18-25 vocabulary words to tell the mystery and the reader must evaluate the vocabulary words to figure out who is guilty. Students use critical thinking skills to solve the mystery. The vocabulary practice uses the vocabulary words in sentences not related to the crime. One thing we love about Critical Thinking Co. is they allow you to copy their products for all your kids. We love that because all my kids want to work through the books. This time Amber and Delaney wanted to use the Vocabulary book. Amber because she loves to solve mysteries and Delaney because she loves vocabulary. I even enjoyed figuring out the mysteries and learned a few new vocabulary words just by discussing the mysteries with my kids. The vocabulary words included words we hadn't either worked on or had forgotten what they meant. Some of them are nescient, otiose, boffo, feckless, and many more we knew. My girls liked learning the new words from the mysteries. Some of them they could figure out from the story, but others they needed to look up to help them solve the mystery. They actually liked looking them up because they wanted to solve the mystery and they wanted to see who could figure it out first. 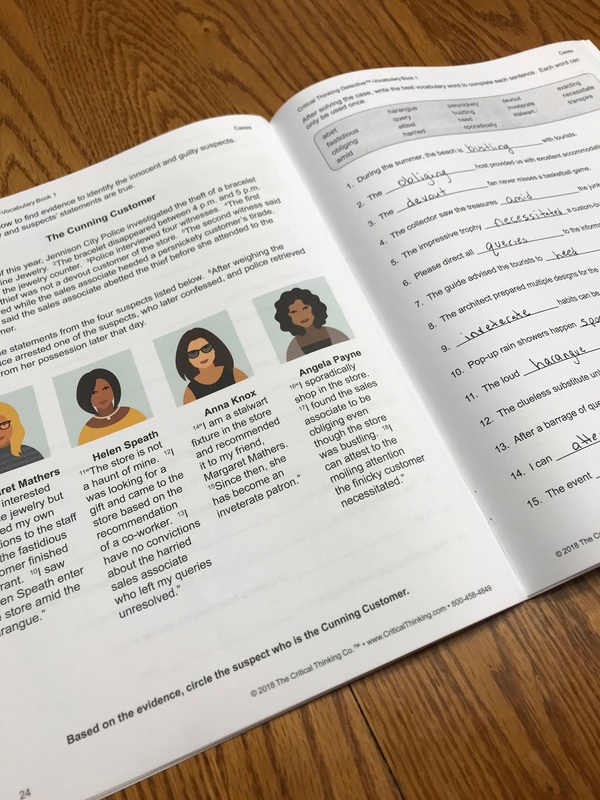 Not only does this book teach vocabulary, but students also improve their critical thinking skills by assessing the evidence and using thinking skills to solve the mysteries. 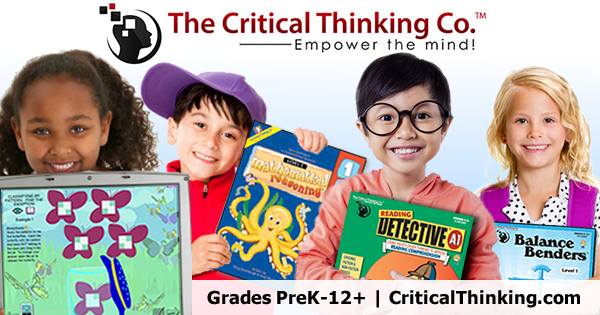 The Critical Thinking Co. has been around since 1958 creating award winning products that are fun and easy to use but also teach children to carefully analyze what they are learning. I think this is more important in today's world as ever before. They will learn how to think critically therefore raising their grades and test scores. 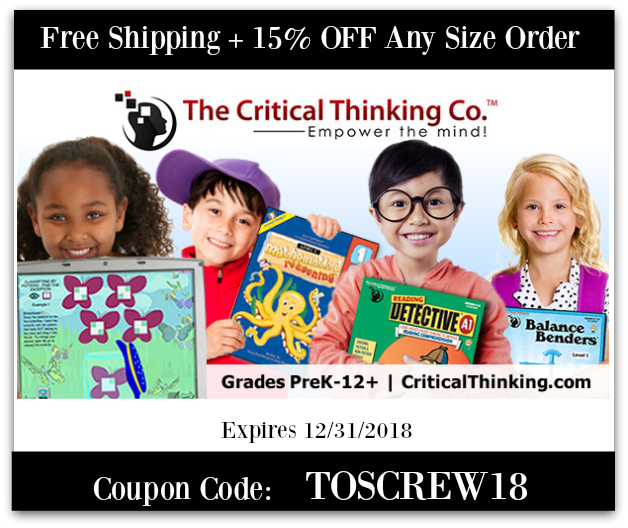 The Critical Thinking Co. would like to offer you some freebies and a coupon code. To receive Free Shipping plus 15% off any size order just use the coupon code: TOSCREW18. This code is good until 12/31/2018. The Homeschool Review Crew received several different titles to review and I'm curious about Something Fishy at Lake Iwannafisha and plan on reading some of those reviews.